Violent clashes in Ukraine, caught the attention of Belarusian state TV. In its coverage, their journalists presented the topic rather tenuously. Participants of the Euromaidan protests appeared on TV as hooligans, with the authorities trying to settle the crisis. State TV also warned its audience that an Egyptian scenario could be in store for Ukraine. Alexander Lukashenka met with the owners of the biggest state and independent media outlets in the country. Thank to a loose atmosphere, participants could openly raise any pressing issues, as one journalist enthusiastically noted. During the meeting, Lukashenka confessed his main ambition: an independent and sovereign Belarus. Violent clashes in Ukraine: Gone out of control. Belarusian state TV followed the ongoing events of the previous days in Kyiv. Barricades, burnt buses and cars – this is how journalists depicted Euromaidan. It associated participants of the protests with hooligans and extremists. “Observers agree that nobody fully control now over the situation in Kiev – neither the Ukrainian authorities nor leaders of the opposition”, one journalist commented. The Minister of Foreign Affairs of Russia, Sergey Lavrov noted that instability in Ukraine could be convenient for someone from abroad, journalist concluded. Kyiv: now radicals run the show. President Viktor Yanukovich ordered setting up a special group for the settlement of the crisis. A State TV reporter informed that militia has already detained 20 people and brought a legal action against them. They can be sentenced up to 15 years. "One analyst pointed out that an Egyptian scenario is being repeated in Ukraine”, journalist commented. Who is guilty of the situation in Ukraine: the Opposition and Western Politicians? Recently the Russian Duma adopted a statement regarding the clashes in Ukraine. It said that “apart from the extremist element of the opposition, Western politicians who interfere in the domestic affairs of an independent Ukraine” also bear responsibility. 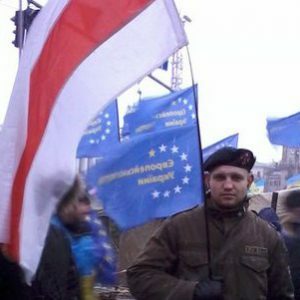 A Belarusian killed in Euromajdan. Among the three killed in Kiev, was a Belarusian, Mikhail Zhiznieuski. Journalist noted that in 2005 the man moved to Ukraine. His mother wanted even to report him as a lost person, the reporter noted. Recently it became clear that Zhnizneuski had decided to participate in the protests. Russia intensifies its struggle against terrorism. Belarusian Channel 1 discussed the proposed changes to the anti-terrorism legislation in Russia. The new legislation has distinct three parts. The first allows FSB officers to conduct a body search of Russians and their belongings. The second bill prevents money laundering and the financing terrorism. The last bill allows for the monitoring of web sites. Journalist stressed that experts did not see anything in the new laws that would pose any threat to citizens' freedoms or rights. Minsk is reviving its old ties in southern Africa. Businessmen from Mozambique visited the Belarusian automotive company BelAZ. They are interested in establishing a joint plant in Mozambique, but also setting up production of Belarusian nitric and potassium fertilisers. State TV mentioned that “before our very eyes, old trade ties are being revived”. Back in Soviet times, BelAZ had been actively delivering machinery and vehicles to the southern region Africa. Rosatom: interested in involving Belarusians in its other projects. Lukashenka met with the head of the Russian state-run nuclear energy conglomerate Rosatom, Sergey Kirienko. They discussed the successful construction of the Astraviec power plant, “one of the biggest Belarusian-Russian projects”. Report emphasised that both Vladimir Putin and Alexander Lukashenka had paid special attention to its construction. Kirienko explained that the plant meets all the necessary safety criteria, including the quality of its construction. Furthermore, it was built in line with the projected budget. He also praised the Belarusian organisations involved into the project. Rosatom might consider employing them for other projects abroad. Belarus-China: strategic partnership to be continued. State TV also covered Belarusian Prime Minister Mikhail Miasnikovich's official visit to Beijing. Miasnikovich and Li Keqiang, the Chinese premier, agreed on a road map for future co-operation between both countries. Belarus and China want to work together on various sectors, including space exploration, aviation, and logistics. One more big Chinese company will start working in Belarus in addition to the other 5 already functioning in the country. The state supports the gifted young Belarusians. State television proudly informed that over 1,200 young talented Belarusians would receive special awards from the presidential fund. In over 18 years of its existence, the presidential fund supported over 28,000 intelligent Belarusians, State TV explained. 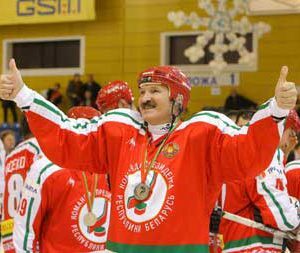 In the words of Lukashenka, there are conditions in the country for youngsters to achieve their dreams. A state TV reporter presented the story of a successful man, Aliaksiei Sikorski, who today became a representative of one of the most famous Russian IT companies. Press conference with Lukashenka. The heads of the eleven biggest and the most influential state and independent media met with Lukashenka for a special press conference. State TV journalist underscored how open and constructive the meeting was. “Always communicative, Alexander Lukashenka has immediately won the favour” of other participants in the event, it was further reported. Journalist did not clearly state which media participated. Lukashenka stressed the importance of youth, that would have the right to vote and perform during the elections. "We should gradually pass the country to other hands", the head of state said. “If someone thinks Lukashenka is strongly holding on to his chair [post] – BD, he is mistaken”, the head of state continued. In his words, elections that would be honest and in accordance with the established rules. “We don't need revolutions”, Lukashenka reiterated. In its coverage, most the footage was of Lukashenka making long speeches. The audience could not really hear the questions coming from the guests. Candidates in the elections will have a right to campaign in state media. Journalist noted a decision of the Central Electoral Committee of Belarus regarding the upcoming elections. All candidates will receive 5 minutes for political campaigning on the local radio stations.